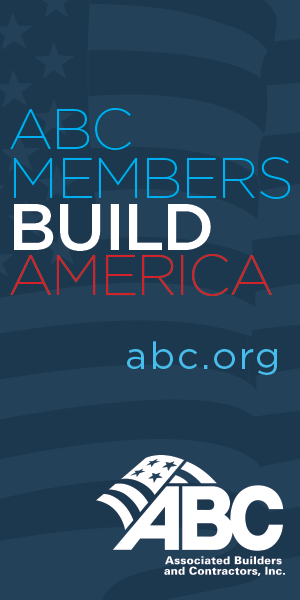 ABC launched its ‘Building America’ Campaign in June 2017. In the lead-up to Legislative Week, ABC worked with Washington, D.C.-based news radio powerhouse WTOP to help tell the organization's story to Congress, the administration and federal agencies. The Building America thought leadership series includes a mix of radio commercials, website ads, video features and digital content that highlight ABC’s commitment to workforce development, safety and the merit shop philosophy. The campaign includes video and audio interviews featuring ABC National Chair Chuck Goodrich, CEO Mike Bellaman and Vice President of HSE and Workforce Development Greg Sizemore. ABC's 2017 branding and imaging campaign helped promote careers in construction and other key priorities through this partnership with WTOP. The radio, website, video and digital content netted 1.8 million impressions on WTOP and $1.6 million in media value through digital signage, radio and program ads during Washington Nationals baseball games. This content is available to WTOP listeners in the ABC Resource Center as well. The campaign ran through the end of the year, promoting podcasts, white papers, a legislative quarterly update and a podcast interview with Greg Sizemore and Jimmy Greene. The Building America campaign, accessible on the WTOP website, ran successfully through the end of the year. In 2015, ABC began a partnership with the Washington Nationals to educate the general public, influential legislators and regulators on the merit shop philosophy and importance of safety, quality and workforce development. Print ads, radio spots, and digital signage were created to showcase the core values held by ABC and its members, raise visibility for the construction industry and promote a positive image of careers in construction to young people, their families and veterans. ABC hosted a celebration for the National Craft Championships gold medalists, the Craft Instructor of the Year and the Craft Professional of the Year at a Major League Baseball game July 3 at Nationals Park in Washington, D.C. These honorees were recognized for their achievements during the pre-game ceremony before an audience of more than 41,000 people. Labor Secretary Alex Acosta attended, highlighting the administration's commitment to boosting careers in construction. Acosta, along with ABC's 2017 National Chairman Chuck Goodrich and ABC Chair-elect George Nash, congratulated the champions on the field. Please note: per the Terms, Trademarks and Confidentiality, all rights to the ABC marketing materials are owned by ABC National and remain the property of ABC National. They cannot be altered in anyway. From schools, hospitals and military bases to skyscrapers, football stadiums and the playground down the street—Associated Builders and Contractors members build communities. Since 1950, we’ve been working to raise the bar for the construction industry based on merit and free enterprise. It’s working, and together, we are building something great in America. From skyscrapers to the playground down the street—Associated Builders and Contractors members build communities. Together, we are building something great in America. At Associated Builders and Contractors, we don’t just build buildings, we build communities. Our member companies are places where performance and achievement are the basis for career advancement…companies where employees can train for high-wage careers and achieve their professional and personal dreams. Want more control of your own destiny? Discover the future you can build for yourself. At Associated Builders and Contractors, we don’t just build buildings, we build communities. Our member companies are places where employees can shape their future and achieve their dreams. Want more control of your own destiny? What’s more American than a level playing field? America has always been about opportunity. And nowhere is that truer than in construction, where a job well done can be the ticket to success. Every day, Associated Builders and Contractors advocates for policies that reward contractors based on merit. Because when it comes to hiring the right contractor, nothing levels the playing field like excellence. And after all, what’s more American than that? Opportunity levels the playing field in America, and Associated Builders and Contractors advocates for construction policies that expand opportunities for contractors based on merit. What’s more American than free enterprise? How important is free enterprise? It pretty much defines the American Dream. And nowhere is this truer than in construction, where competition drives quality ever higher. Associated Builders and Contractors fights every day for policies that strengthen and protect our cherished free enterprise system. We believe that the freer we are, the better we do. After all, what’s more American than that? Associated Builders and Contractors fights for construction practices and policies that strengthen our cherished American free enterprise system. We believe that the freer we are, the better we do. What’s more American than doing your best? America has always been about doing your best. And nowhere is that truer than in construction, where second best should never be an option. Every day, Associated Builders and Contractors advocates for policies that reward excellence and transparency in contract bidding. Like our members, we believe that doing your best should be your best shot at success. After all, what’s more American than that? America has always been about doing your best. Associated Builders and Contractors advocates for policies that reward excellence and transparency in construction bidding. What’s more American than the American Dream? America has always been about working hard and achieving dreams. Nowhere is that truer than in construction, especially now when entry-level wages in the trades often outpace starting salaries of positions requiring a college degree. Associated Builders and Contractors help the best and brightest get training that turns dreams into dream career in the trades. After all, what’s more American than that? America has always been about achieving hard won dreams. Associated Builders and Contractors helps the best and brightest get training that turns dreams into dream careers in the trades. America is built on the idea that if you work hard, you’ll get ahead. And, in today’s construction industry, you can build a great career with your own hands. Jobs are tight and college is expensive, but skilled labor is in high demand. On average, craft professionals earn over $6,000 more per year than recent college graduates. Discover how you can construct a brighter future as a trained craft professional. In today’s construction industry, you can build a great career with your own hands. Earning over $6,000 more per year than recent college graduates, craft professionals are in high demand. Start building the good life.